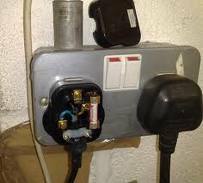 Employees or members of staff that are Untrained should not be allowed to carry out remedial repairs to electrical equipment themselves. 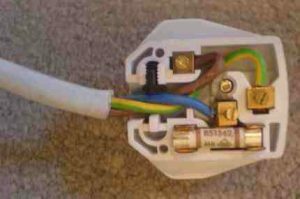 In the example on the left, someone has to joined two wires together leave the core wires exposed and un-insulated . 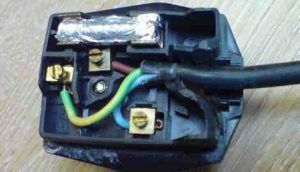 A potentially lethal situation and one of the most dangerous things we’ve come across during PAT Testing a school. The live and neutral wires on this appliance have been switched in this incorrectly wired plug. Comprehensive checks carried out by our engineers to ensure the plug is wired correctly and that the earth connection is intact. Incorrectly wired or missing earth connections are extremely dangerous. This item was re-wired free of charge as part of our service. 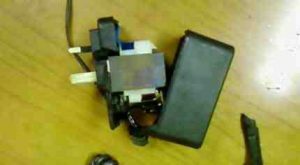 Yet another example here of an untrained member of staff creating a dangerous situation by trying to repair a blown fuse themselves. Our engineers check all plugs to make sure fuses are of the correct amperage and that dangerous self-repairs haven’t been done. 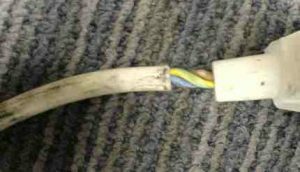 Mobile phone chargers and other AC adaptors are very susceptible to damage because they often sit underneath desks where they get kicked around. 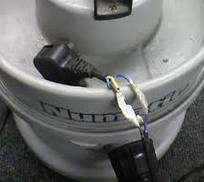 The wiring of equipment that is in regular use or poorly connected can easily become loose or disconnected. A common and extremely dangerous situation if not fixed.